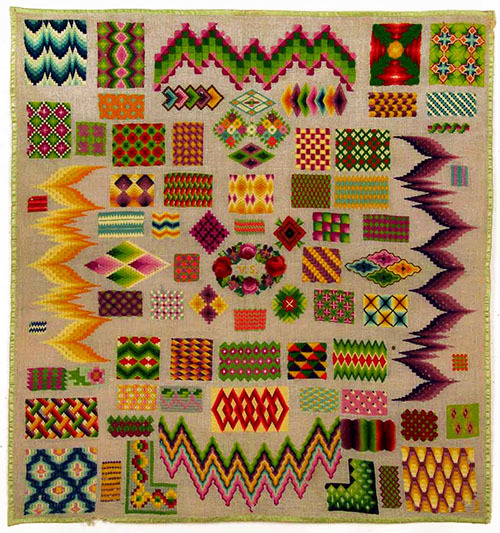 Berlin wool work was the most popular form of embroidery during the middle decades of the nineteenth century, when it was marketed as an easy and economical way to update home décor and dress. Around 1804, a Berlin–based print seller made available hand–colored canvas–work designs drawn out on paper with a fine grid, in which each square represented a hole in the canvas. Due to their immediate success, other print sellers in the same city and elsewhere soon offered similar designs. Their great appeal lay both in the ease of execution and in the shaded effects achieved with vividly–colored soft merino yarns. 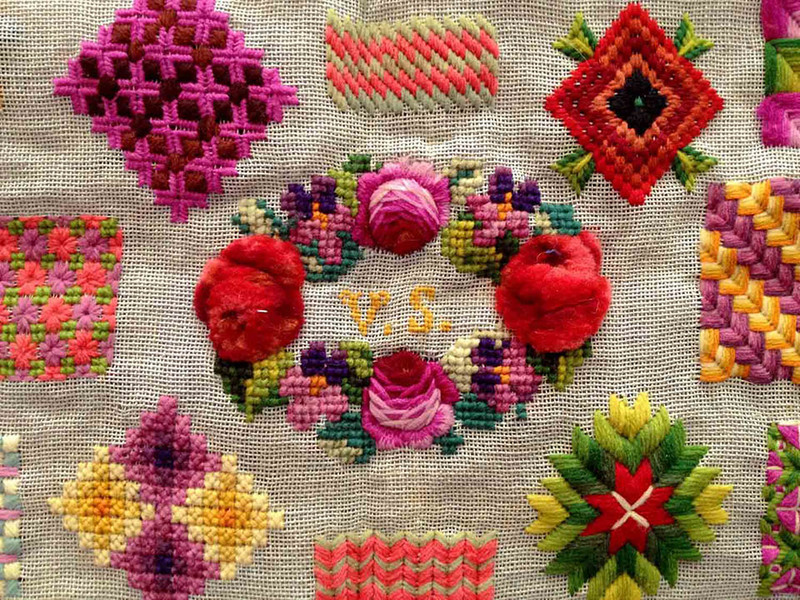 Although sampler making by young girls had declined by the mid–nineteenth century, the embroiderer of this piece, identified as “V S,” produced a strong graphic statement with her carefully balanced composition and startling combinations of colors. The almost harsh shades of pink and purple indicate aniline, or synthetic, dyes, which were discovered in the mid–1850s. The primarily geometric and stylized ornamental motifs are worked in an imaginative use of stitches, including tent and reverse tent, cross, double straight and Smyrna cross, Florentine, brick, and diamond eyelet, all entirely well–suited for counted–thread embroidery. Many of these stitches were given different names within the period to suggest that they had been newly introduced. The three dimensional roses at the center are formed both by padding and by plush stitch, sheared to create a sculptural effect. The sampler's vibrant palette and the highly naturalistic style of the full–blown flora are typical of mid–nineteenth century taste.